Any questions or comments? Feel free to ask 'em. I also like feature requests and very much appreciate bug reports (these are especially helpful if you also attach a copy of your log file in the GAMEEX>PLUGINS>DT LOADER folder). Leave your comments or get the full changelog at the release thread located here. (1.2.7) Added a drive letter option, which you can use to set up DAEMON Tools using drive letters. 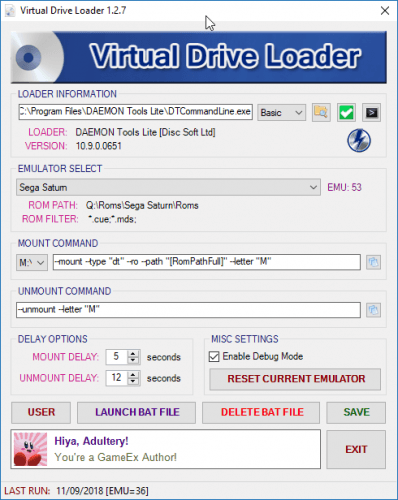 Just make sure you save your Command Line after you select your Virtual Drive! (1.2.7) Added Delay Options on the main screen > Set the delay before or after mounting to up to 30 seconds! (1.2.5) Other various code optimizations and "stability improvements"